Home / Recipes / Chocolate Chip Cookies! Amazing and soft and chewy! Chocolate Chip Cookies! Amazing and soft and chewy! If you are not crazy you LOVE chocolate chip cookies. Well, these are beyond amazing. I like a soft, chewy, filled with chocolate cookie and that is what I have been working on for years the perfect cookie recipe! After combining several recipes over the years, and enjoying taste testing…I did it. My husband approves and little John kicks every time I eat one so it is sort of kid approved! 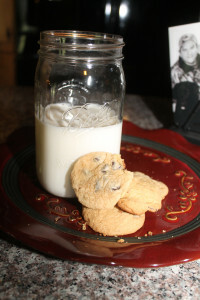 Now, enjoy a awesome glass of milk and awesome homemade cookies!